Long ago on a distant planet a brilliant scientist creates the ultimate recording device: a tiny mobile black hole with a penchant for stealing memories and destroying the people they belong to. The recording device known as Mnemon destroys its home world and then spreads to other worlds absorbing memories and killing the people they belong to. Approaching a special anomaly Mnemon is transported to the milky way. Later out on the moon Jon Stewart and Atom are making a routine patrol around the moon when something crash lands near by. Despite warning from Batman and Flash in the Watchtower Jon and Atom rush out to investigate. Atom has trouble with a song stuck in his head as he comes upon the recording device imbedded in a moon crater. 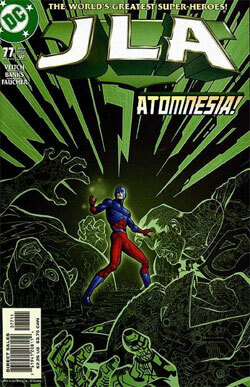 Atom shrinks himself down and crawls inside when he discovers he's lost the memory of how to expand. Not soon after Jon forgets how to use his ring. Flash speeds out to the scene and rescues Jon and recovers Mnemon and brings them back to the Watchtower. Just as he returns to the HQ Flash can't stop running, he's forgotten how. Inside Mnemon Atom learns the device is a sentient miniature black hole who thrives on memories. Mnemon reveals his plan to destroy the earth and the JLA as he's done countless times before. Wonder Woman, Firestorm, and Superman show up to lend a hand but soon each one of them forget about one another and they start to fight amongst one another. Atom shrinks down as tiny as he can, because he can still remember to shrink, and tells Superman to use his heat vision to break Mnemon and force it to release all the memories it's been storing. But the black hole inside is going critical and it's all Superman can do to contain the gravitational forces between his hands. With intense struggle Superman manages to fly the device out into space and dispose of it through the same special anomaly that it arrived. Mnemon is trapped floating aimlessly in space with no memories other then a simple song stuck in its mind. Story - 1: This issue had three elements that were going for it: Miniature black holes, memory loss, and Superman struggling to contain said black hole with his bare hands. But those three cool sticking points are wasted in a fill in issue that falls short. The dialogue is reminiscent of "Super Friends" and campy. Firestorm and Wonder Woman irrationally decide to beat up on Superman. I mean even if they couldn't remember him wouldn't they at least retain their personalities? Would Wonder Woman and Firestorm be so quick to attack someone they didn't know without provocation? The only silver lining here is that next issue begins a new arc with new team members by the good old regular creative team. Art - 2: The art is bland and uninteresting. It seems to be very generic art that doesn't have any style or punch to it. The backgrounds work would be the good if it weren't all pale solid colors. Cover Art - 4: The cover is great. The intricate cyber lines that fill in the forms of the heroes are extremely detailed and they give a new dimension the bodies.